I have often claimed that if left to my own devices, I would have the exact same TV watching habits as my grandfather in 1978. It’s true. I could watch Columbo over and over. I am have not been able to pinpoint exactly why I enjoy it as much as I do, but I am sure that it has to do with the character being considered an outsider, having his abilities being underestimated, and him using that to his advantage. I find that entertaining. Columbo is an American crime fiction television film series, which starred Peter Falk as Lieutenant Columbo, a homicide detective with the Los Angeles Police Department. The character and television show were created by William Link and Richard Levinson. The show popularized the inverted detective story format. With the exception of a few special episodes, almost every episode began by showing the commission of the crime and its perpetrator. Therefore, there is no “whodunit” element. The plot mainly revolves around how the perpetrator, whose identity is already known to the audience, will finally be caught and exposed by Columbo. Lt. Columbo is a friendly, verbose, disheveled-looking, American police detective (of Italian descent) who is consistently underestimated by his suspects. Suspects are initially both reassured and distracted by his circumstantial speech and increasingly irritating pestering behavior. Despite his unprepossessing appearance and apparent absentmindedness, he shrewdly solves all of his cases and secures all evidence needed for indictment. His formidable eye for detail and meticulous and dedicated approach become apparent only late in the storyline. The character first appeared in a 1960 episode of the television-anthology series The Chevy Mystery Show, which was itself partly derived from a short story by Levinson and Link published in an issue of the Alfred Hitchcock Mystery Magazine as “Dear Corpus Delicti”. Levinson and Link adapted the TV drama into the stage play Prescription: Murder, and a TV-movie based on the play was broadcast in 1968. The series began on a Wednesday presentation of the “NBC Mystery Movie” rotation: McCloud, McMillan & Wife, and other whodunits. After one season, the series moved as a group to Sundays and were replaced on Wednesdays by a series with a similar format with fare such as The Snoop Sisters, Cool Million, and Banacek. Columbo aired regularly from 1971-78 on NBC, and then less frequently on ABC beginning in 1989. The final episode was broadcast in 2003. The episodes are all movie-length, between 70 and 100 minutes long. The early episodes ran for an hour, until the decision was made to expand them to full television movie-length. On October 2, 2011, reruns of Columbo began airing Sunday evenings on the classic television network Me-TV. In 1997, “Murder by the Book” was ranked #16 on TV Guide’s 100 Greatest Episodes of All Time. 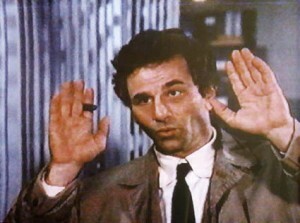 and in 1999, the magazine ranked Lt. Columbo #7 on its 50 Greatest TV Characters of All Time list. Just one more thing….I loved him too.